"Too many people think homesteading is a snap. Eh, how hard can it be? You plant seeds, they grow. In a few months you harvest a bountiful crop and can/freeze/dehydrate it. You get a cow, you milk it. Criminey, what’s the big deal? How hard can it be? ... What concerns me are those who people think they’ll wait until AFTER the bleep hits the fan to move rural and learn self-sufficiency ... because, after all, how hard can it be?" "Because I don't know where else to put this, I thought I'd add that we've found out that you're right -- it's hard to be self sufficient. We've lived in our new place for 9 months and wanted to do chickens and a garden first. I was SO proud of our garden -- it's neat rows of baby green things shooting up. Then, a storm to end all storms, torrents of rain washed all my seedlings away and the garden never recovered. As for chickens, we had 21 last spring and since then we've lost 2 to owls, 16 to raccoons, and the remaining 3 have mites. Listen to Patrice, y'all!" I sincerely hope Heather sticks it out. The learning curve is steep on a homestead, but well worth it in the end! UPDATE: Reader "Montana Guy" had an excellent point: "The only ones who never fail are the ones who never try to create anything." Amen and well said. There's a very good reason homesteaders tend to warn new arrivals not to bite off more than they can chew. Invariably newbies do that anyway (we're four years in, and still doing it) but hopefully less dramatically than they would otherwise have done. On one hand, it's nice always to have a list of fulfilling projects awaiting your attention. On the other, when the status of some of those projects decides whether you stay warm this winter or not, or whether your investment of time / money / sweat / whatever in some other project succeeds or fails, and when you have to decide to be warm in the winter and let the investment disintegrate, it gets a little more difficult. 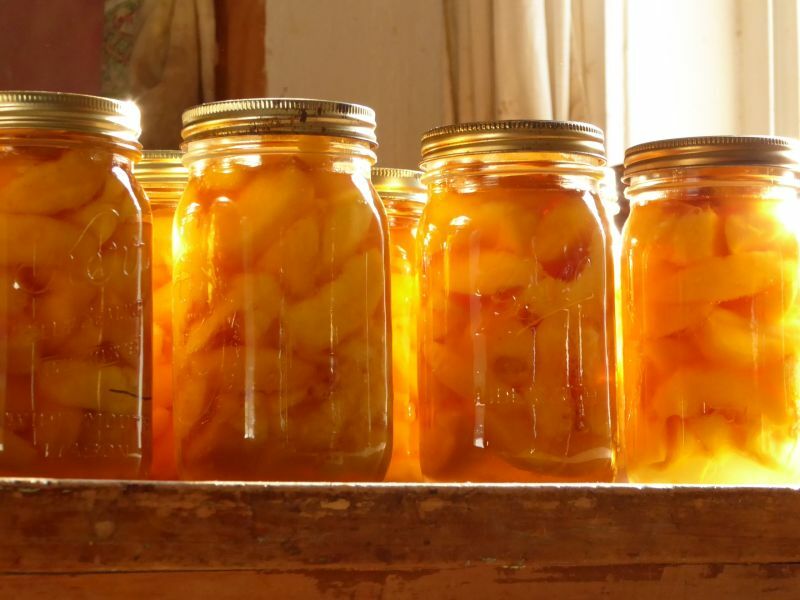 As I turned buckets of apples into jars of applesauce this week, I wondered if I could sell any of my apples. Many had spots and some were not symmetrical. They were delicious, thin skinned, and juicy but would never earn a place on a supermarket shelf because the public expects an apple to be overly large, flawless, and shiny. I marvel at my jars of pink applesauce lined up on the counter waiting for me to get five minutes to put labels on them. How timely is your column! I hope you do not mind my giving one more piece of advice to those who haven't started: be on the hunt for "less than perfect apples and pears" from local sources, as the spots can be cut out, you can make sauce, apple butter and pie filling and you can do it so much cheaper than you can buy at the store and you will also get the experience of water bath canning your product (which you can do in any pot you can put your jars in and get the water level at least one inch over the jars). You don't have to have an orchard, find someone whose blessings were far too great! What a great post! I'm there!!! This is us. Plain and simply - this is us. This is/was/will be all of us. Heather, you wrote to share your story so others could be reminded to heed the advice of Patrice and start now. It truly was a great reminder. It can be easy and fun to start seedlings indoors and then a force of nature polishes them off, despite our efforts, despite how much we are counting on that garden. I have had my garden destroyed by hail and early and late snows. Seven of my first eight chickens were mauled by two pups from down the road. We cleaned the up, doctored them, kept them warm and to our surprise they all lived, but it wasn't because we did everything right and nothing wrong. I lived where a very early snow that followed two days of rain, killed thousands of cattle. The hoop houses we had constructed of cattle panels were under five feet of wet heavy snow and when we got them dug out, the panels were flattened. Sometimes, it's not that we do anything wrong. We just have to continue to do our best, keep learning, work like the ant and give thanks to God. for Heather, I read somewhere (can't remember which blog) that sprinkling diatomaceous earth in the chicken coop (on the floor, I think???) kept the chickens from getting mites. Hope this helps. oh yes, I forgot, I can't remember if that was regular diatomaceous earth or food grade. Probably a google search would turn up the info. Thanks, we'll check it out! I'm afraid my girls will eat the diatomaceous earth so I haven't bothered with it yet. Does it really work? It will not hurt the chickens to eat the DE. We put it in our chickens feed, as well as our other animals (cows, dogs, humans). We do the same thing. Use on all our animals and in the garden, and use as flea control on the dog. We do use the food grade. Heather, the only ones who never fail are the ones who never try to create anything. Hang in there. Your ARE learning. Like Grandma use to say, 'Good judgment comes from experience. Experience comes from bad judgment'. Oh boy, I can relate to that! Amen! Homesteading is difficult. My husband and I have been married for 32 years, and have had a garden every year. 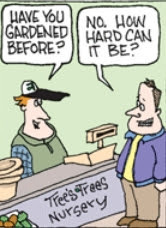 We really do know quite a bit about gardening. The only thing we have a problem with is the weather. No matter how hard we try, we can't control it. My point-You can do everything right and still have your garden fail. Store up in times of plenty so that you may have something to eat in the times that are scarce. I was familiar with rural living already, and have watched my mom take care of her horses since I was a kid. I did understand and I didn't have the skills to raise livestock. I've taken care of other people's livestock for a couple weeks at a time, milked the goats, cared for a flock, but never my own day in and day out. So, I rented some pasture and now I have three goats! Gah! Even I think I'm nuts, but I look at this as a self study class I'm taking everyday. I've also encountered an added bonus I didn't really take into account. When you have helpless animals depending on you to take care of them, getting up in the morning is so much easier. I'm not a morning person, but I get up everyday at 6:30 now. I used to still be in bed when my husband left for work. Now I'm up before him and can make him breakfast! I used to stay up late because I didn't have anything to get me up in the morning until the toddler woke up. Now I go to bed before 10:00Pm and I sleep like a rock. I'm getting chicks from a hatchery in the spring, maybe rabbits in the fall. I'm trying to now jump the gun and get them all, just learn one set of animals at a time. Even with the goats, none of them are old enough to be bred, so I'm just taking my time learning how to keep them alive. Next spring and Fall I'll start the learning process of breeding, kidding and milking. Here's to adventure of learning just how hard it is! I grew up with parents that had wonderfully successful gardens in VA. So we were quite surprised when our first year of gardening in FL yielded about enough edible produce to fill a gallon jug. We read. We asked locals. We have improved every year since. My experience has been that hens will take care of the mites themselves if they have access to sand for "baths". Sand is all we have in FL, so it's easy. However, I have friends with caged hens that provide large kitty litter pans of sand (with drilled holes for drainage) for their hens. As far as loss to predators, I have only seen two good solutions - chicken tractors or a good livestock dog. We have a great Anatolian Shepherd that faithfully watches over our hens. However, we learned along the way that it is quite difficult to TRAIN a livestock dog and not all dogs (even in the same breed) are suited to chickens. If you are going that route, make sure your first livestock dog is pre-trained. Oh, Heather. It was so sweet of you to share. Don't give up. You've crossed over. It must have been hard to watch your chicken flock decline steadily like that. When I planted my very first veggie garden years ago, an old- timer told me, "Plant zucchini. It's foolproof. It will boost your confidence." I planted 4 hills of it. Zucchini everywhere. Hear me roar! Remember when "Castaway" Tom Hanks pounded his chest and bellowed to no-one there after he finally started a fire: "I HAVE MADE FIRE!!!" ? Now I know one hill is enough. Again, local knowledge is everything. 'Round here, the zucchini grows great - till the squash bugs show up. We don't even bother with it anymore. Argh! Squash bugs. Never even heard of them until I moved to SW Idaho. Squash plants were failing everywhere. A local said "oh, you have squash bugs". Now I know for next year. Get them early with soapy water. I've raised pigs. My neighbors had chickens and cows. I've raised my own gardens. Canned tomatoes, beans, carrots, anything I could. Self-suffiency is HARD. Eating only what you grow is HARD. Raising animals is HARD. Hunting is HARD, and often fruitless, especially if others around you are hunting as well. Survival doesn't just mean keeping to yourself on your farm, because quite honestly that's impossible. You have to have a support network of people around you who also think the same way you do, and who will work with you to provide what you cannot make, grow or raise yourself. Homesteading isn't child's play. Even serious homesteaders rely on others such as vets, farriers, and other farmers. There is no one person who can be entirely self-sufficient. Realizing that is a wake-up call. It's also the first step to making yourself as sufficient as possible. Two years ago we had a terrible hail storm that left most of our garden with nothing more than short, bare stems with the exception of the zucchini which had a few leaves nested in the center of the formerly big plants. There was a layer of hailstones around the stem. We replanted everything else that wasn't too late to produce in our hot summers. Apparently hailstones kill squash borers as we had a wonderfully long season of zucchini production. With very little other production from our garden we ate zucchini every, sometimes twice a day, and were happy to have a fresh, organic vegetable. No, we didn't really get tired of it. Vegetable hunger prevents that. It finally gave up in late August, six weeks later than our latest before that time. By then we have a few other things beginning to produce small quantities. We never were completely garden-vegetable free due to the amazing zucchini production. As long-time gardeners, we accept that crops fail, but this proved that not everything will always fail at the same time. As a suburbanite I feel your grief. How can one fail if seeds are germinated in a nice commercial greenhouse, then taken to a properly prepared garden site and transplanted. First night moths ate the heart out of cabbages. Next day laid carbyl (horrors) around cabbage and covered with row cover. Second night more cabbage was dined upon. Just transplanted chard and spinach from greenhouse.. Same story first night. Didn't I learn first time? Did but muscle spasms kept me from finishing job first night. Just about lost it all. But I will try again with lessons learned. Was thinking this morning of how this community (me too) has disparaged Big Ag.for all it's abuses in it's animal and crop methods. But we have to admit that thus far they have our back when we experience the failures we all have shared. Starvation is a terrible thing and so many would be there if not for Big Ag. They have their own failures with their methods but could add to that the many failures we have shared (bugs eating transplants the first night) if not for their methods. We have a superior method but failure sometimes is guaranteed. "Let us not lose heart in doing good, for in due time we will reap if we do not grow weary." So go our and "happen to things!" I just deleted a SPAM with a Subject line that made me think of this post: "Your problems with chicks are over" Of course what they meant by "chicks" was almost certainly different :>) No email is going to solve your problems.